Queen’s Wood is one of four areas of woodland in Haringey classified as ‘ancient woodland’, land that has been wooded for at least four hundred years. The closely spaced mature trees, dominated by oak and hornbeam, and the dense under-wood give the impression of a woodland, unchanged by time. It may well have been continuously wooded since prehistoric times. But, in fact, the history of the wood reveals a story of dynamic and constant change, change driven in part by nature but more importantly by the human exploitation of the rich resources that the wood provided. Mike Hacker, a long standing member of Friends of Queen’s Wood, is writing a summary of the history of the wood since pre-historic times. He has been involved in a number of small scale archaeological investigations since 2010 and his report will consider what they tell us alongside documents and maps. And anyone who wants to know more about the geological background should follow this link to an article by Diana Clements for the Amateur Geologists’ Society. 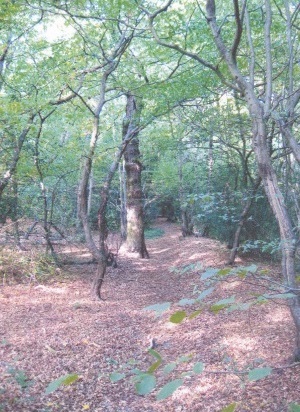 Whilst Queen’s Wood did form part of an extensive area of woodland in Hornsey, for most of the last thousand years, and possibly since prehistoric times, it was not untamed wildwood but was managed, grazed woodland dominated initially by lime and then by oak and hazel and in more recent centuries, hornbeam. It was one element in a mixed and varied landscape that included areas of pasture, cultivated land and heath. Having been managed as open wood-pasture for many hundreds and perhaps thousands of years, by the beginning of the 16th century the woodland had become degraded through over-exploitation. To ensure the regeneration of the woodland and the continued supply of woodland products, the wood was enclosed by woodbank boundary to protect it from browsing animals. Following its enclosure, the wood was managed as coppiced woodland, with oak standards and a coppiced understory of hornbeam. Traces of the enclosing wood- bank can still be seen in the wood. The history of the wood is closely related to its proximity to London and it had formed part of the Bishop of London’s extensive estates from early Saxon times. But this long continuity of ownership was interrupted in the 17th century. This was a politically and socially turbulent time and during Cromwell’s Commonwealth, the woods were seized and sold to a City businessman, Sir John Wollaston. After the restoration of the monarchy, the woods were passed back to the Church. Shortly after this, in 1665, the population of London was decimated by an outbreak of plague. It is widely believed that some of the victims of the plague were buried in the wood. The available evidence suggests that if there was a plague pit in the area it was probably located not in the wood itself, but on former common land adjoining the wood. The wood continued to be managed as coppiced woodland into the 19th century, but towards the end of the Queen Victoria’s reign, the Ecclesiastical Commissioners began to release land for housing development. Proposals to develop the wood were met with public opposition and protest. As a result, the wood was purchased by the Hornsey Borough Council, renamed Queen’s Wood to mark the Queen’s golden jubilee and opened as a public park in 1898. Queen’s Wood today is designated as a Statutory Local Nature Reserve and a Site of Metropolitan Importance. It is no longer managed to provide timber, fuel and food, but managed to sustain and enhance the biological diversity of the wood. It is now a public open space, a haven for wildlife and a place of leisure and relaxation. 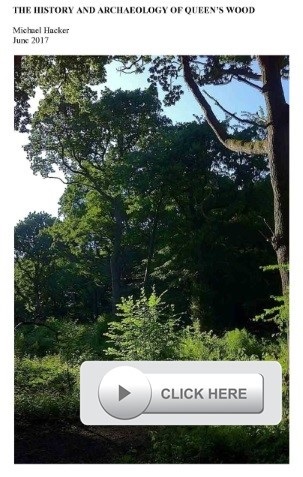 Click the picture to read the history of Queens Wood or .